In addition to his many achievements and contributions to medical science, Nobel Prize winner Sir Frank Macfarlane Burnet immersed himself in the Australian bush as a keen hiker and beetle collector during his student days and beyond. 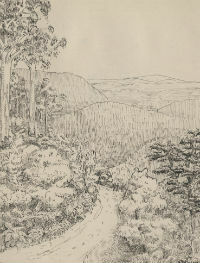 in a recent blog post University Archivist Katrina Dean examines Frank McFarlane Burnet's handwritten and illustrated hiking diaries and laboratory notebooks held at the University of Melbourne Archives. Highlights include an early hiking diary from 1920 and a laboratory notebook on bacteriophage experiments and infectious diseases dated 1932-1939. These notebooks have recently been on display at the Biomedical Breakthroughs exhibition at Melbourne Museum. To find out more about the holdings of the Frank Macfarlane Burnet material at the University of Melbourne Archives, see the finding aid prepared by the Australian Science Archives Project.